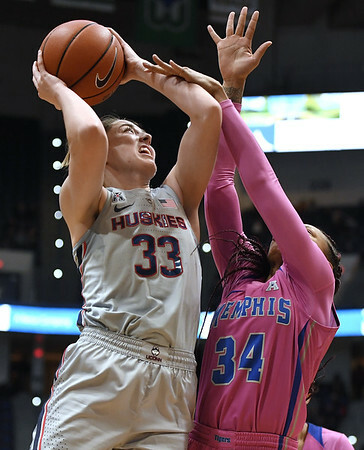 HARTFORD - For three quarters Wednesday, Katie Lou Samuelson made a run at her first triple-double. In the fourth quarter the UConn women’s basketball team’s senior guard cheered on the reserves and got the green light from coach Geno Auriemma to go in the huddle during a time out to diagram a play. Sources indicated that she would be washing uniforms through the night. So, what can’t the two-time All-American do? “According to coach, play defense,” Samuelson said with a smile. It was that kind of night for the Huntington Beach, California, native. She finished with a season high 32 points - including an 8-for-11 effort from 3-point land - along with 10 rebounds and seven assists as No. 3 UConn routed Memphis 102-45 in American Athletic Conference action before 8,869 at the XL Center. The cause for concern for some coming in was the physical beating Samuelson took during Sunday’s game against Central Florida in Orlando. While she kept her streak of scoring in double figures in every game this season alive by making all 12 of her free throws, she was 0-for-5 from the floor. It marked the first time since she played three minutes in a win over Florida State in her eighth career game she did not make a field goal. It took her 19 seconds to get back on track Wednesday as she nailed a corner jumper. With 3:20 gone, she had matched her point total from Sunday with her fourth 3-pointer. “You play every game the way it’s being played. You have to deal with what’s being dealt with that game,” Auriemma said. “The way the game was played Sunday there was no rhythm or flow to it. Lou couldn’t get into a rhythm or flow. She still got a lot of open looks, they just didn’t go in. In the second time out in an eight-second span in the fourth quarter, Samuelson took Auriemma’s seat in the huddle and came up with a play for the reserves to run. “I feel like with that group, I always try to get into the huddle at least once every game to just make sure they’re all on the same page,” Samuelson said. It was about the only thing that didn’t work. Samuelson’s rebound total gives her 591 in her career. Remember how Auriemma joked that the Huskies did not get “The Rebounding Samuelson” at the 2017 NCAA Bridgeport Regional? The youngest sister is five away from topping the combined total of her older sisters Bonnie and Karlie. And when she grabs nine more rebounds, Samuelson will join Maya Moore, Breanna Stewart, and Diana Taurasi as the only players in UConn history with 2,000 points, 600 rebounds, and 400 assists. It was the Huskies’ final game of the season at the XL Center. They start a two-game road trip at Tulsa Sunday where a win would assure them at least a share of the AAC regular season title and the No. 1 seed for the AAC tournament. They then go to play at Wichita State for the first time on Tuesday. Posted in The Bristol Press, UConn on Thursday, 21 February 2019 22:18. Updated: Thursday, 21 February 2019 22:21.